I am also joining in with Watery Wednesday for the first time. When I saw these photos I knew I would have to do both. Please visit these sites to see the other participants. You can click on the word fullscreen to see the larger version of the photos . There are 24 pictures in all so make sure you click on slide show or one of the other choices to see them all. Hey wait, don't go yet...did you leave me a note? Really liked photo,would make a good jigsaw puzzle,I am puzzle mad and love a challenge,this would be a good one. Best wishes for the new year Carolyn. Super, fantastic, beautiful beyond words...I wish I had this water At The Farm. Looks like a good swimming hole for those days when it is almost too hot to breathe! Waving at you from the seashore, which is frozen! Photographs in slide show appear to be done by a professional. I am speechless! Oh, how gorgeous! I cannot believe these images. They are just stunning, Lori! What a nice break in the day to get to see these. These are the coolest pictures, Lori. You outdid yourself this time! And I want to say that I LOVE your new blog design. It is more YOU!! Lori~ I thoroughly enjoy these slide shows. The winter slide was incredible too. The Matthew Watts photo of the birds is so beautifully vibrant. I can't imagine what it takes to capture a shot like that...his timing must be impeccable. Thanks for sharing his images. I've not seen his photography before. I will certainly be looking for more. Oh, my! That's a gorgeous shot! I love the reflection and that wonderful shade of green in the water. 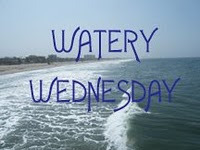 Hope to see you back for more Watery Wednesdays! That is a gorgeous photo. What a nice job you did with it. Kudos.